Ticks are small insects that attach to one’s skin and draw blood while also releasing secretions into the bloodstream. Ticks can be of various varieties and sizes and do not always carry disease. Ticks are found across the world ticks and the common ones include spinose ear tick, black-legged tick, American dog tick, paralysis tick, lone star tick, etc. What are the Causes of Tick Bites? What are the Signs and Symptoms of Tick Bites? 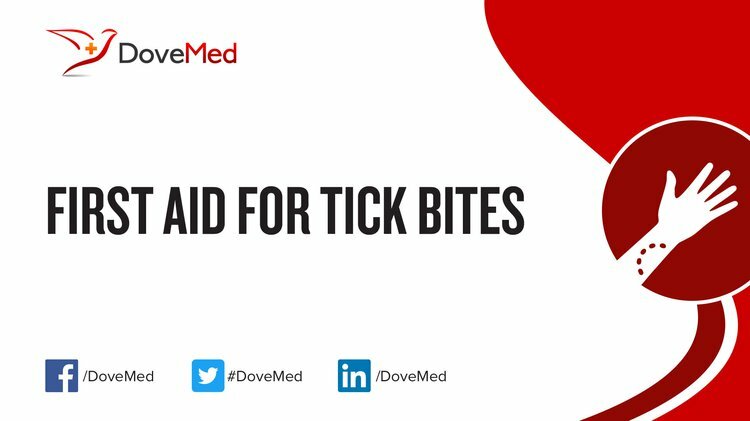 The signs and symptoms of Tick Bites vary based on the size of the individual affected (amount of toxin in the bloodstream), tick strain/species, and what disease, if any, is carried by the tick. The symptoms can be expressed within a few hours to a few days following the Tick Bite. How is First Aid administered for Tick Bites? Who should administer First Aid for Tick Bites? First aid can be administered by the affected individual or someone near the affected individual. What is the Prognosis of Tick Bites? How can Tick Bites be Prevented? van Velsen, L., Beaujean, D. J., & van Gemert-Pijnen, J. E. (2013). Why mobile health app overload drives us crazy, and how to restore the sanity. BMC medical informatics and decision making, 13(1), 23. Forgey, M. W. D. (2017). Wilderness medicine: beyond first aid. Rowman & Littlefield. Aboutaleb, N., Beersma, T., Wunderink, H. F., Vossen, A., & Visser, L. G. (2010). Case report: West-Nile virus infection in two Dutch travellers returning from Israel. Eurosurveillance, 15(34), 1. World Health Organization. (2010). International travel and health: situation as on 1 January 2010. World Health Organization. McGain, F., Welton, R., Solley, G. O., & Winkel, K. D. (2016). First fatalities from tick bite anaphylaxis. Journal of Allergy and Clinical Immunology. In Practice, 4(4), 769. Miller, N. J., Rainone, E. E., Dyer, M. C., González, M. L., & Mather, T. N. (2011). Tick bite protection with permethrin-treated summer-weight clothing. Journal of medical entomology, 48(2), 327-333. Rappo, T. B., Cottee, A. M., Ratchford, A. M., & Burns, B. J. (2013). Tick bite anaphylaxis: incidence and management in an Australian emergency department. Emergency Medicine Australasia, 25(4), 297-301. Otranto, D., Dantas-Torres, F., Giannelli, A., Latrofa, M. S., Cascio, A., Cazzin, S., ... & Capelli, G. (2014). Ticks infesting humans in Italy and associated pathogens. Parasites & vectors, 7(1), 328.